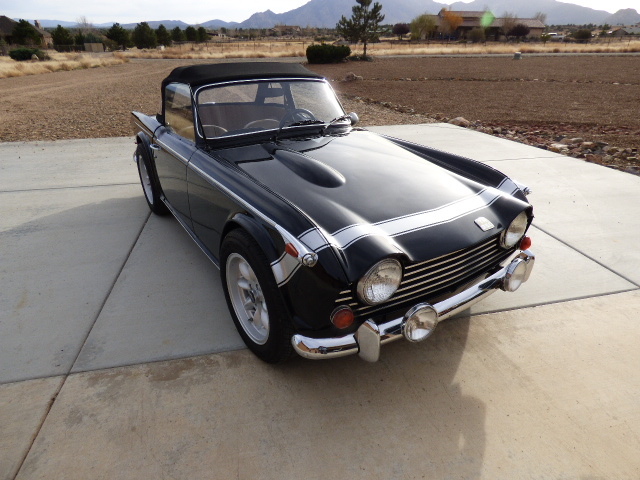 One of our Good Friends has this Fabulous 1968 Triumph TR250 that he has chosen to let go of after Many Years of Prideful Ownership. I’m quite pleased to be of Service and I’m Excited to help find this Great Sports Car a New Home. Have a Look at all the Pictures and Please be sure to Read the Total Advertisement, as there are many Important Details Described Herein. This Particular TR250 has had a Professional Frame Up Restoration Performed by Heritage MotorSport (http://www.britishheritagemotorsports.com/). The Paint and Body Work Crafted by Dalton & Son Auto Body. 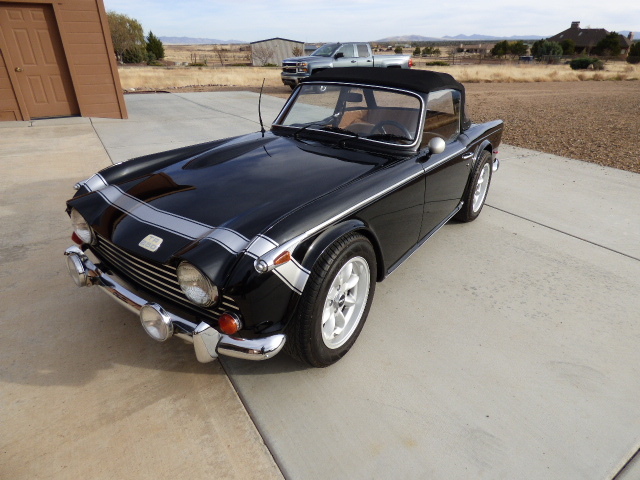 It has been Fitted with a StayFast Cloth Convertible Top and comes with a very nice Tonneau Cover as well. Scroll down through all the Pictures and Detailed Improvements. The current owner literally saved this Treasure from Extinction. 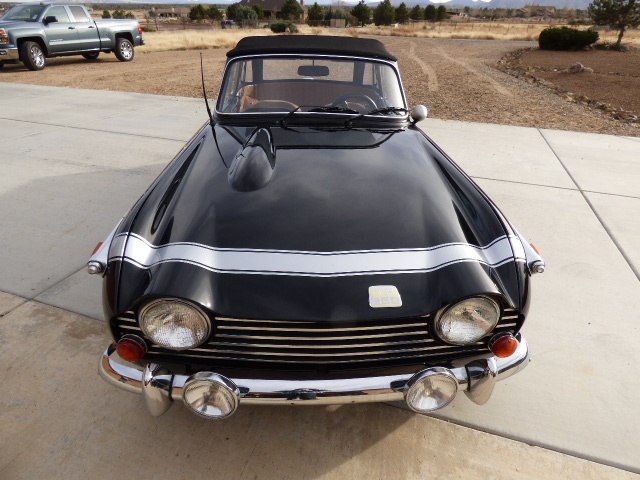 “On one fateful day, I picked up the phone and heard my friend at Heritage Motorsports in San Diego say: “ I have a TR250 for you that needs restoration, but before you get too excited you really need to see it.” I had recently completed the restoration of a second TR6 and was looking for a more unique car for my next restoration project. Early the next morning, I found myself standing in front of a TR250 that was painted a bold spray can blue. It was clearly in desperate need of help. A young Naval officer had taken it to Motorsports to get it ‘fixed up’, but when he found out how expensive it was going to be in time and money, he decided to sell. Thus, began a 5 year, frame up professional restoration effort on what my wife called — the Blue Blunder. The TR has had the Frame Stripped, Painted, and Fitted with New Body Mountings. The Front and Rear Suspension, all Brakes and Bearings, the Drive Shafts and U-Joints Rebuilt or Replaced. Inside the Interior has had a Complete Restoration and the Convertible Top Upgraded to Heavy Duty Cloth. Under the Hood the Engine and all Components have been Thoroughly Rebuilt. The Over-Drive Transmission and the Differential are Rebuilt as well. Literally every Component has been Meticulously Transformed to as Good as or Better Than what She Was New. Painted Black Urethane with Grey Nose Stripe. Panasport Wheels running Yokohama 205/60/R16 Tires with Low Miles. Stayfast Cloth Convertible Top. Tonneau Cover. Full Prep and Painting Including Inside of all the Body Panels, any Panel with Rust was Replaced with Proper Parts. Chrome bits have all been Re-Chromed and kept Polished. Water Nozzles, Headlight Gaskets and Adjusting Kites Replaced. Windshield, and Seals Replaced. New Side Marker Lights and Tail Light Assemblies. Re-Chromed Front and Rear Bumpers, Side Marker Housings, and Door Handles. All Smith Gauges Reconditioned. Hand Crafted Solid Walnut Dashboard. New Upholstery, Seals, Weather Stripping, and Carpet. Dashboard, Center Console and Center Gauge Cluster Redone. All new Custom Deluxe Interior from Moss, including Door Panels and Seals, Armrests, Trim Seals, Carpet Set, Floor Mats, Shift Knob, and more. Pedal Pads, Dash Knob Set,Transmission Tunnel Cover, Floor Pad, Defroster Vents, Wiring. Nothing left UN-Restored that I am Aware of Except one Switch on Dash that was Unavailable at the Time of Restoration. Balanced and Blue Printed Engine Rebuild including New Pistons, Rings, Bearings, Seals, Main and Rod Bolts. They Installed the Fast Road 83 Cam from Triumph Tune and New Lifters, Valves, Guides, and 1.55 Ratio Roller Rockers. New Parts Throughout: Water Pump, Fuel Pump, Starter, Clutch, Pressure Plate, Throw-Out Bearing, Belts and Hoses. New Custom Intake Manifold and Triple Rebuilt Stromberg Carbs. Performance 6 into 2 Exhaust Header. Complete New Clutch and Brake Master Cylinders, Lines, and all Brake Components. Silicone Brake Fluid. Uses High Quality CAT ELC Coolant. Enhanced Cooling With 4-Row Radiator and 14" Electric Cooling Fan/185 Degree Thermostat. Upgraded 80+ Amp Alternator. Pertronix Ignition. Oil Changed at 3000 Miles using 20-50 WT and ZDDP Additive. Added Rear Sway Bar for Driving Stability and Comfort. Adjustable Trailing Arm Bracket Kit, Rear Axles, Stub Axle, Boots, and Covers. New 3.45 Gear Set for Differential with New Seals and Bearings. Poly Mountings and Bushings. All New Shocks and Rear Spring Set. Major Suspension Overhaul Front to Back. Rebuilt Steering Rack with New Boot Kit. New Exhaust System. Trunk Interior Set and Seals.